Welcome to the first edition of the War Resisters' International's War Profiteers' News!! This new email newsletter will provide information on the new developments on arms trade; the increasing role of private companies in the outsourcing of the military and private financial institutions as they profit from the arms trade. It will also provide information and reports from what organisations and movement are doing on this issues. Regular columns will be the war profiteer and the campaign of the month highlighting one company and promoting one campaign. This issue of The Broken Rifle focuses on the Campaign Against War Profiteers.This campaign has been developing throughout the past year. The Campaign Against War Profiteers is one of the three main areas of focus for the Nonviolence Programme during this period. "Some one is making a killing from war"
WRI is not just committed to resist war but to promote nonviolent action to remove the causes of war this is one reason why part of the new nonviolence programme will be a campaign against war profiteering. And to promote our commitment with nonviolence and antimilitarism. Taking WRI's fundamental critique that "War is a crime against humanity. I am therefore determined no to support any kind of war, and to strive for the removal of all causes of war"
What kind of War Profiteers are there? There are many ways to profit from a war. Some may say that even peace campaigns profit from it! The war profiteers we are talking about here are companies having strategies to make a killing from armed conflicts. Conventional army suppliers Three main categories are distinguished here: arms traders, equipment suppliers, and companies offering services to armies. Arms traders must not be forgotten. War and tensions imply a very profitable arms race for arms traders. Banks know this well, and are very keen to profit from it. The only problem is uncertainty, which the market doesn't like. Sept 10: DSEi, Beat the Bombers! Party for peace. Gather 1pm for location information www.disarmtrade.org/. Cancel the arms fair. 2pm-4:30 pm. Musical Protest outside the Excel Centre, next to Custom House, DLR Station. In his Farewell Address in January 1961, American President Dwight D Eisenhower said: "In the councils of government, we must guard against the acquisition of unwarranted influence, whether sought or unsought, by the military industrial complex. The potential for the disastrous rise of misplaced power exists and will persist. For the past year, War Resisters' International has been developing a new Nonviolence Programme. The overarching aim of the Nonviolence Programme is to strengthen and deepen our understanding of nonviolence, nonviolent strategies, and nonviolent campaigning, and to develop and provide tools and support to groups using nonviolence (see Broken Rifle No.65). 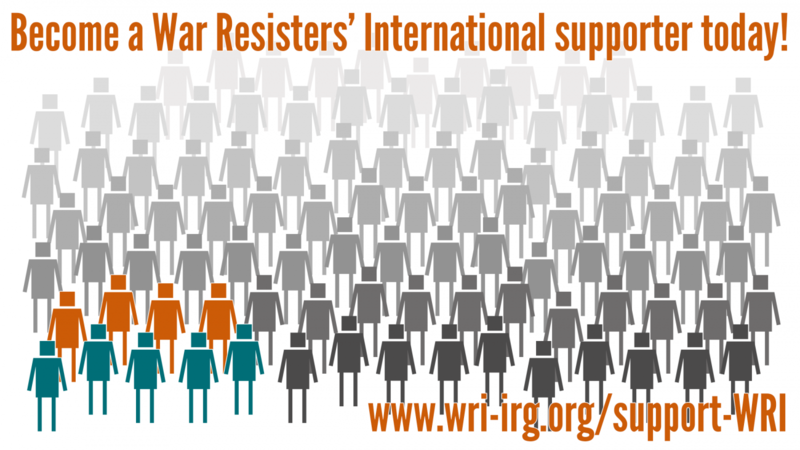 One aspect of this work is the development of resources for WRI's Campaign Against War Profiteers. Serco is part of the consortium that runs Aldermaston. Since the company began its involvement with the British nuclear weapons programme, women from the Aldermaston Women's Peace Camp(aign) (AWPC) began organising a shareholder campaign. As Serco Group plc is a huge and rapidly expanding company AWPC had expected their AGM to be a moderately impressive affair: not a bit! Whilst the coffee and apple Danish were pretty classy, and the atmosphere reeks of money, privilege and power, the meetings themselves are very small and short. War Resisters' International's new project the Global Initiative Against War Profiteers aims to coordinate and promote campaigns against war profiteers. It is inspired by Arundhati Roy's call at the World Social Forum in Mumbai in January 2004 for the movement to focus on major corporations profiteering from the Iraq occupation. As we remember imprisoned peacemakers, Xabi Agirre Aranburu argues the case for imprisoning those responsible for war crimes as a necessary step in preventing war. The town of Stolac's position on the front-line had made it an obvious target of Serbian artillery ever since the war In Bosnia begun. One particular morning In the summer of 1992 began with the usual Serbian bombardment. This time, the shells landed, but did not explode.